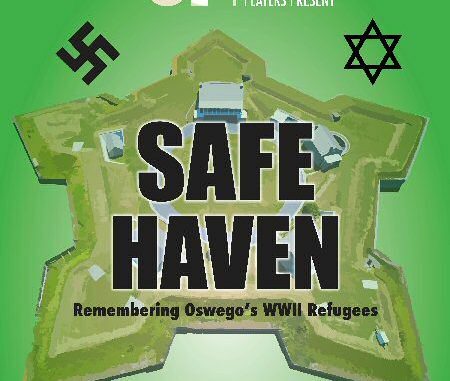 OSWEGO – Director Richard Mosher announces open auditions for “Safe Haven” an original play written by fellow Oswegonians Michael S. Nupuf and Laura Lowrie. Auditions will be held April 3 and 4 from 5-7 p.m. at the Frances Marion Brown Theater, Civic Arts Center, Oswego. Auditions are open to the public and no prior experience is necessary to try out for a role. The powerful fictional representation tells the story of the Levy family during its stay at the Safe Haven refugee encampment on the Fort Ontario grounds from August 1944 to February 1946. The play will include original music written at Fort Ontario during this period and vivid period audiovisual effects. “Safe Haven” will be presented in dinner theater style on June 1 and brunch matinee style on June 2 at the American Foundry in Oswego.